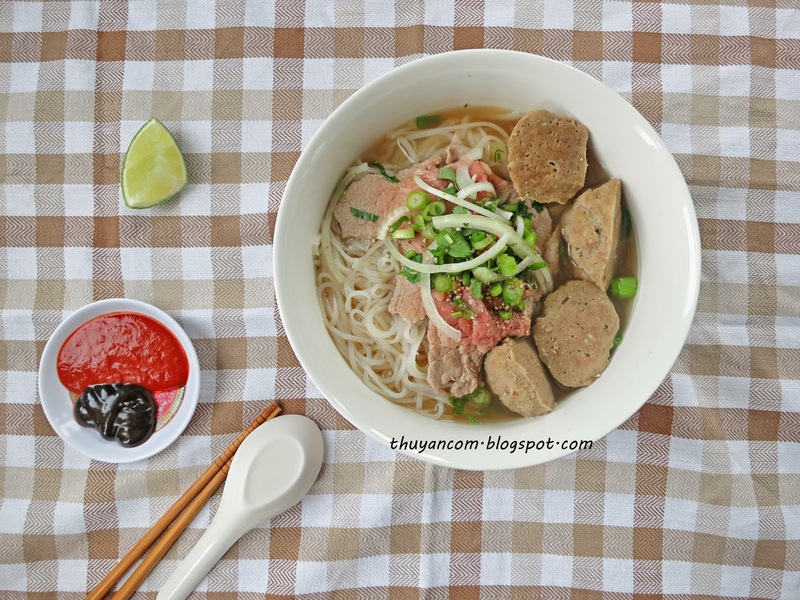 I'm a huge fan of bo vien, Vietnamese beef balls, made popular by pho. Frozen bo vien nowadays is not the same quality as before. I get that it's processed meat but lately i'm unsure if it's meat i'm eating or just a bunch of fillers. A year ago I decided i'm never going to buy frozen bo vien again, i'm making my own from now on! I was fortunate to learn the basics of making bo vien from my friend's mother several years ago. She always had homemade bo vien in the freezer. It was so good, we would eat it by itself with Sriracha. Unlike the frozen bo vien, you can actually taste and feel the meat. Don't mistake dense bo vien as quality bo vien, the denseness is actually just flours mixed in with the meat. Homemade bo vien are chewy and spongy! I never got the chance to write down the exact measurements but I knew exactly what goes into making bo vien. Took several tries but I came up with something i'm satisfied with. Beware homemade bo vien is A LOT of work because the process is very time consuming. The key to making good springy bo vien is the process of stretching and binding; which require using the food processor over and over again and time in the freezer. What kind of meat should you buy? You can buy the mot expensive cut like shank or you can buy something more wallet friendly like ground chuck or even ground beef. I usually wait for a sale on ground beef so I can stock up. Go for something with more fat (I use 80/20), lean meat tends to be dry. I like trimming the fat on beef products and save it to make bo vien. Why is it time consuming? 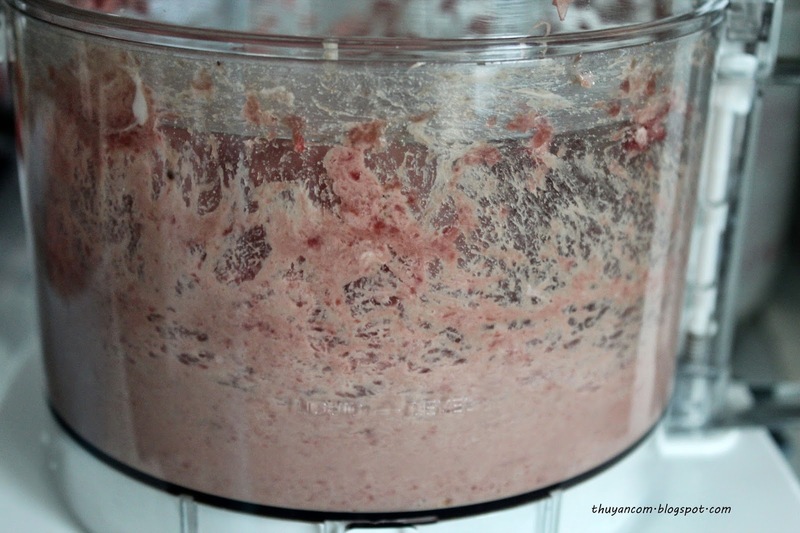 Once you mix all the ingredients together, the next step is to grind it into a paste in the food processor. You want to grind it at least 3 times, the more times you grind your meat the springier the texture of the beef balls. That doesn't sound too bad right? There is more! 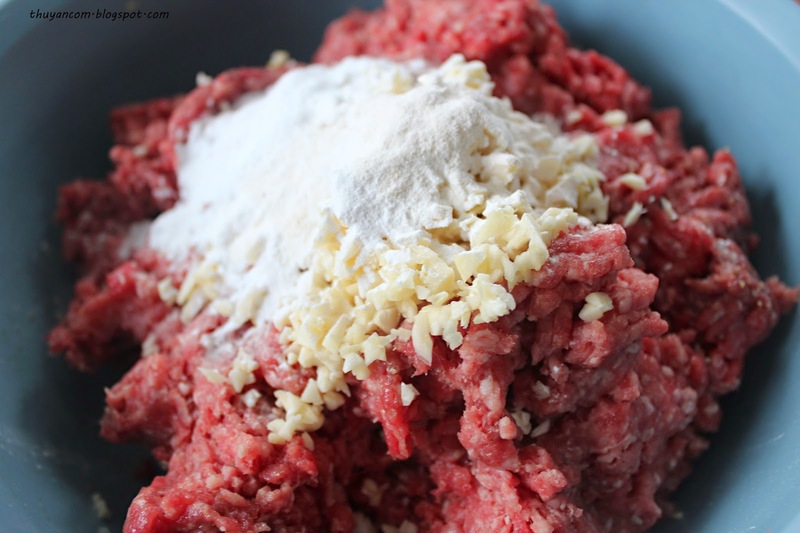 In between using the food processor, you have to let the meat rest in the freezer so that the meat will bind together. Basically you grind your meat, you let it rest in the freezer, and then you repeat that at least 2 more times. After every round of grinding, the meat will get heavier and heavier. Therefore you have to grind less at a time or you might risk breaking your processor. Now just imagine doing all that with 4 pounds of meat, it literally take up the whole of the day. If you are still reading this, let's go make some bo vien! 1. Combine all the ingredients except for the crushed ice and tapioca starch. Thoroughly mix everything together. 2. I divided the mixture into 3 batch, maybe more or less depending on the size of your food processor. 3. Start the first round of grinding, the easiest round. Put the first batch in the food processor and start grinding. Sprinkle 1 tablespoon of tapioca starch for each batch as it is grinding. Continue to let it grind until it become paste like, see picture below. 4. Once you grind all three batch into a paste, combine in a bowl and let it rest in the freezer for about 20-30 minutes. Make sure you wrap the bowl up well so it doesn't harden. 5. Take the beef paste out of the freezer. Start round 2 of grinding. The meat should be heavier than before so you might want to grind it in smaller batches. Adding a little bit of crushed ice will help the grinding. 6. Start the second round of resting in the freezer, don't forget to wrap it up well again. 7. Repeat the grinding and resting at least one more time. 8. Remove from freezer. Now you begin balling your beef paste. It's up to you how large or small you want it to be. I like making mind large to save time, and whenever I eat it I just cut it up. Rub some vegetable oil on your finger and hand to help you ball more easily. 9. 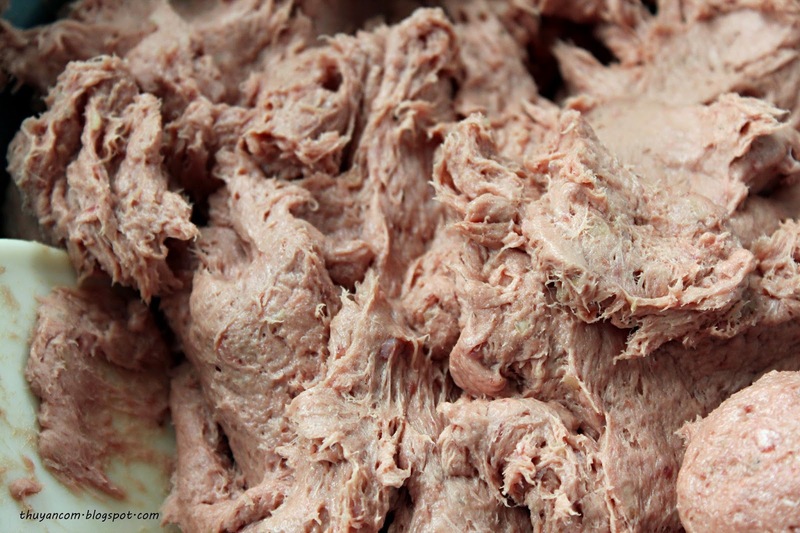 Once you ball up all the beef paste, cook them in boiling water. 10. 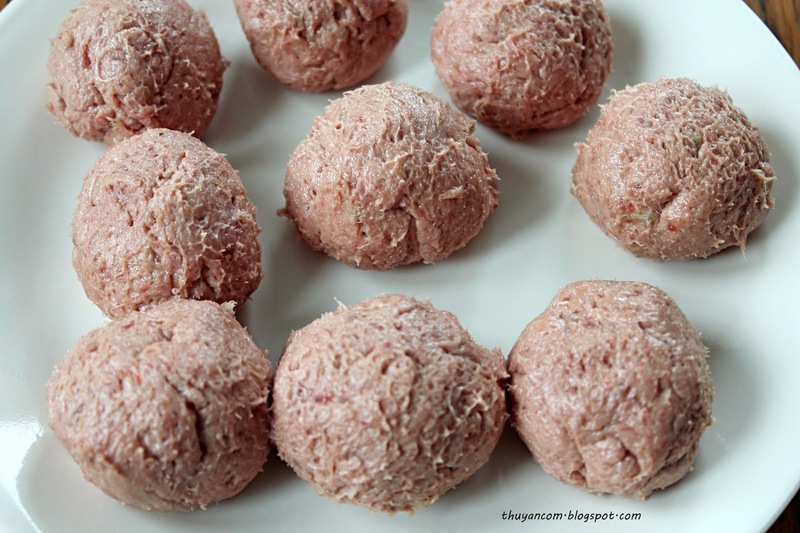 Remove cooked beef balls and place in an ice bath. 11. Remove from ice bath. They are now ready to eat or for storage in the freezer. thank you so much for the recipe, I was desperately looking for a good one ! how long does it last in the freezer?